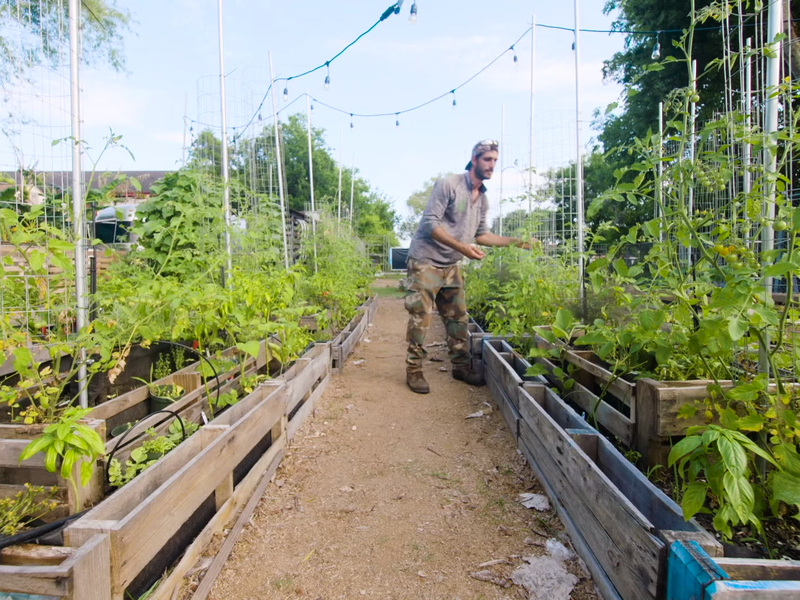 Girard Children’s Community Garden in Washington, D.C. was created on a vacant lot and is now a thriving community space for neighborhood kids. Most of us know that spending time in nature makes us feel good, but many city children have few opportunities to find that out for themselves. A chain of community gardens in Washington, DC, provides anecdotal evidence that green space reduces stress, and now a controlled Philadelphia study gives more scientific proof that that is exactly what’s going on. Rhitu Chatterjee reports at National Public Radio, “Growing up in Washington, D.C.’s Columbia Heights neighborhood, Rebecca Lemos-Otero says her first experience with nature came in her late teens when her mother started a community garden. ” ‘I was really surprised and quickly fell in love,’ she recalls. The garden was peaceful, and a ‘respite’ from the neighborhood, which had high crime rates, abandoned lots and buildings, she says. “Now a group of researchers from Philadelphia has published research that supports her experience. The study, published Friday in JAMA Network Open, found that having access to even small green spaces can reduce symptoms of depression for people who live near them, especially in low-income neighborhoods. “Previous research has shown that green spaces are associated with better mental health, but this study is ‘innovative,’ says Rachel Morello-Frosch, a professor at the department of environmental science, policy and management at the University of California, Berkeley, who wasn’t involved in the research. ” ‘To my knowledge, this is the first intervention to test — like you would in a drug trial — by randomly allocating a treatment to see what you see,’ adds Morello-Frosch. Most previous studies to look into this have been mostly observational. “South and her colleagues wanted to see if the simple task of cleaning and greening these empty lots could have an impact on residents’ mental health and well-being. So, they randomly selected 541 vacant lots and divided them into three groups. They collaborated with the Pennsylvania Horticultural Society for the cleanup work. You can read what happened at National Public Radio, here. Girard Children’s Community Garden will be celebrating 10 years this year. The garden signs are in both English and Spanish. Today’s post is about an illicit prison garden, but a 2014 story at NPR, here, suggests that approved gardens are finding favor with corrections officials. 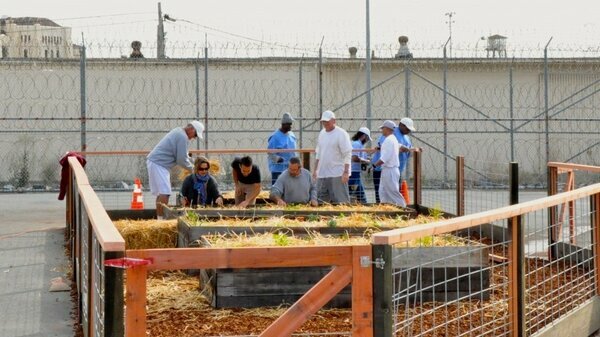 The photo is from San Quentin. This story from the Marshall Project on twitter is about a secret garden behind prison walls — and what it meant to the gardeners. Matthew Hahn, an ex-offender, wrote the article in collaboration with the online magazine Vice. “I used to be a vegetable smuggler. It’s not how I got to prison, but it’s what I did once I was there. “I wasn’t alone. The men with whom I worked in the garden on ‘China Hill’ at California’s Folsom Prison were there with me, every day, waiting in line to get back into the prison building and hoping the guards wouldn’t discover the vegetable contraband they had secreted away in their clothing. “We had a hill, and a job on it, and a single guard, also our supervisor, who expected us to work only a couple of hours per day, after which he permitted us to while away the rest of our time as we saw fit. “We weren’t actually allowed to garden, but that didn’t stop us from doing it. The unspoken agreement between the guard and us men was that we would keep China Hill from becoming an overgrown jungle, and in return he would pretend he didn’t see any of our vegetables growing there. It was motivation to keep us working. “The vegetables we grew were the kinds that never would have made their way into the chow hall: We had squash, peas, chili peppers, bell peppers, watermelon, green onions, tomatoes. “We were never able to smuggle in enough vegetables for entire meals — just morsels, just momentary freshness in our stale world. But we smuggled in memories when we smuggled in those tastes: memories of freedom.” More here. When I was at the magazine, I often sought out authors from different regions who could write about the benefits of community gardens to low-income neighborhoods. Kai remembered that and tagged me on Facebook when he posted an article yesterday about a comprehensive farming initiative in inner-city Detroit. Robin Runyan writes at the website Curbed Detroit, “This week, the Michigan Urban Farming Initiative (MUFI) revealed its plans for the first Sustainable Urban Agrihood in the North End. “Wait, an agrihood? It’s an alternative neighborhood growth model, positioning agriculture as the centerpiece of a mixed-use development. There are some agrihoods around the country, but in rural areas. This is the first within a city. “MUFI’s agrihood spans three acres on Brush Street, a few blocks up from East Grand Boulevard. MUFI runs a successful two-acre garden, a 200-tree fruit orchard, and a children’s sensory garden. They provide free produce to the neighborhood, churches, food pantries, and more. “The Community Resource Center will include office space for MUFI, event and meeting space, and two commercial kitchens on the first floor. A healthy cafe will be located on vacant land next to the CRC. The article credits Sustainable Brands, BASF, GM, and Herman Miller and Integrity Building Group for providing much-needed help on the project. 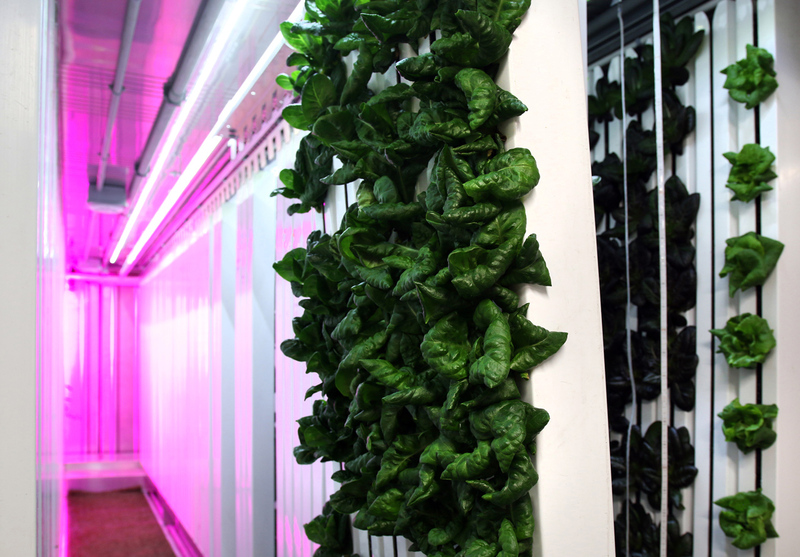 The Michigan Urban Farming Initiative. “It’s intended for early-stage entrepreneurs. ‘We’re here to help them become future leaders in food,’ says Musk, who also runs a network of school gardens and a chain of restaurants that aim to source as much local food as possible. Among the sights I’ve wanted to photograph in the last few weeks is a sculpture outside the Umbrella Community Arts Center. It invites you to look through and focus on an aspect of the view. My friend Meredith is a featured artist at Concord Art’s new juried show. She has done several treatments of her fica plant, but the one in the show is a lovely collage of painted paper. I recently discovered on a morning walk that the Providence Preservation Society has generously opened its multilevel garden to the public during certain hours of the day. What a peaceful place to just sit and think! Not far away is the What Cheer Garage (I like the name). Across Providence, you can discover a fine-looking hen on the wall of Olga’s Cup and Saucer, and a street art stencil recommending Speak no evil, See no evil, Hear no evil. I also like the alley alongside the Providence Performing Arts Center and a hilly street that looks more like Europe than New England.